At Blue Dog RV Kennewick, we’re excited to pair you with your ideal truck camper, travel trailer, motorhome, or one of our other quality new or used RVs. With nearly 40 years of experience, we’re dedicated to serving our customers by providing exceptional service along with a diverse inventory of recreational vehicles. At our dealership in Kennewick, Washington, we’ll help you through the RV buying or renting process from start to finish. When you’re looking for RVs for sale in Kennewick, WA, your search ends here. 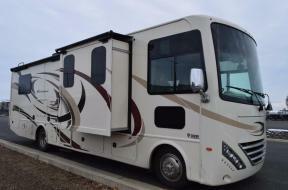 Explore our selection of new and used RVs to find the RV that suits your lifestyle. Easily hitch a fifth wheel campers or a more compact travel trailer on your compatible vehicle for convenient transportation, or opt for a motorhome so you can fit the entire family. At Blue Dog RV Kennewick, we will find you exactly what you’re looking for. Check out our parts center if you’re looking to accessorize your new RV. Schedule an appointment with the qualified technicians in our service center when your RV needs to be repaired or serviced. To learn more about our RVs, services, and more, contact us or call (509) 396-5885.